3 Days in Barranquilla – too many or too few? Michael: For years I have heard bits and pieces of stories about my wife’s father and him being originally from Barranquilla, Colombia. But I never met anyone from that side of her family. Graciela: My husband’s question sort of took me by surprise, but then again not really. He is always reading something about a place in Colombia and curious about it. Throughout our lives my sister and I have had only limited contact with my father’s family. The short story is my grandparents thought he married below his status with my mother since she was from Ecuador. They completely cut him from the family, even one time closing the door of the house in his face when he came to visit. I never met those grandparents. The last I saw of any relatives from that side of the family was about 20 years ago after the death of my grandparents. My aunt and counsin stopped by in Bogotá for a short visit. Michael: My wife told me that her aunt, the youngest sister of her father, was still alive and that her cousin is still in Barranquilla. Always one for a new Colombian adventure I said to my wife, “Let’s go visit them.” To my surprise she agreed. But then came the difficult part, finding where they lived. 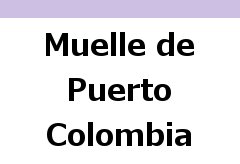 Colombia does not have a large national directory on the Internet. Several phone calls later to Bogotá relatives she obtained a possible contact number. What took place after my wife called surprised me. Barranquilla is on the coast of Colombia. We refer to people who live there as Costeños. They refer to Bogotanos as Cachacos. Each area has its very own recognizable accent. She invited us to visit the following weekend when her daughter, who now lives in New York City, would also be visiting. Considering the length of the drive and cost of gas, it just seemed the best value came from flying to the coast. Interesting is that while most domestic flights leave from the national airport, our Avianca Airlines flight to Barranquilla departed from the newer El Dorado. Time in the air is about 45 minutes, though it seemed longer with the screaming kid a few rows back. We landed at Ernesto Cortissoz International Airport located in the suburb of Soledad. There was no shuttle going to the city. A negotiated $10 USD taxi ride got us there. Some drivers tack on a gringo tax. So be sure to ask the driver how much before entering the cab. Amounts quoted to us varied by as much as double. The 45 minute ride to Barranquilla traversed the town of Puerto Colombia. Definitely the area, with temperatures year round of 80 degrees Fahrenheit (28 degrees Celsius) and rain only about 75 days a year, is not very green. I saw brown grass and litter filled lots everywhere. The drive was on roads much better than the pot-holed things around Bogotá. Construction of apartments rose everywhere. Later a local told me it was because the cost of living is well below that of Cartagena and Santa Marta. Both of those coast cities are only about an hour’s drive away. In looking at statistics the population of Barranquilla has doubled in the last ten years. It appears the trend is to continue. Depending upon which on-line site you check there are between 66 and 80 hotels in Colombia’s fourth largest city. Before leaving we sought advice from both Bogotanos who had visited Barranquilla and the relatives living there. Unanimously they agreed the best value is the 26 story Barranquilla Plaza. But can I recommend the hotel to visitors from other countries? To check I asked the receptionist, “Just how well do you speak English?” Her reply and our short conversation following came back fluently spoken and pretty much accent free. Everything else met standards I am use to in the USA, and exceeded them in some areas. My wife and I enjoyed many of the amenities. A cozy small bar just down from the lobby provided evening relaxation. But what really sold me is their included-in-the-price breakfast. Buffet style you can take your meal outside near the pool where waiters will pour coffee. And the offerings are beyond great. Fantastic taste is a better description. They had arepa de huevo and chicharon. But with my recent heart procedure my wife limited me to one of the former and gave me such a dirty look when I reached for the later that it never found my plate. Though we were told to eat at the restaurant on the 26th floor our time fell short. But others have given the eating establishment fantastic reviews. Location is important as well. We had no problem getting taxis to any part of the city. Great restaurants, bars and a mall are all within walking distance. In fact I enjoyed walking around the neighborhood in the cool of the evening. Graciela: Ask a young person what to see and do in Barranquilla and they rattle off bars and dance places. Our question went more to historical places and museums. “Nothing,” the taxi driver told us. “Really not much,” came from the relatives. “Perhaps the Catedral,” my cousin said. 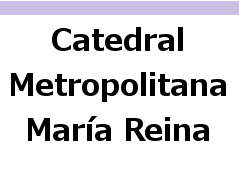 So, while she went to her work, Michael and I grabbed a taxi from the hotel to the Catedral Metropolitana María Reina. Michael: Exiting the taxi I looked around expecting one of the beautiful old 17th to 19th century churches that dot Colombia. It took me awhile to figure out that the very modern looking large building was what we came to see. Once inside the charms of the building revealed themselves. The stained glass side windows are about 80 feet high and 20 feet wide. They seem less dominating though as the building is 46,000 square (4,273 square meters)feet in size. A focal point behind the alter is the statue “Cristo Liberador Latinoamericano”, a 16 ton sculpture by Rodrigo Arenas Betancourt. He is the same Colombian artist who did the 14 ton naked Simon Bolivar in Pereira. A large open plaza fills the area across from the cathedral. Called Plaza de la Paz (Plaza of the Peace) it was originally built to hold the large crowds that came to see Pope John Paul II when he visited in 1986. I have to give Barranquilla credit. If this was in Bogotá it would probably be surrounded or occupied by hawkers of every kind. Instead it is indeed a large open place to be enjoyed. That evening Graciela’s cousin took us to Malecon Leon Caridi. Getting there required leaving the city behind. The buildings could be seen in the distance. A small parking lot to the walkway contained people selling drinks, food and other items out of the their vehicle. A few police stood around. People of all ages strolled along on the colorful tiles. Some lingered on the strategically placed blocks designed for people to sit. While the view of the Magdalena River is nice, the smell, from what I can only believe is the pollution, is a distraction. With a little bit of cleaning the place has the possibility of being an city asset for residents and visitors. 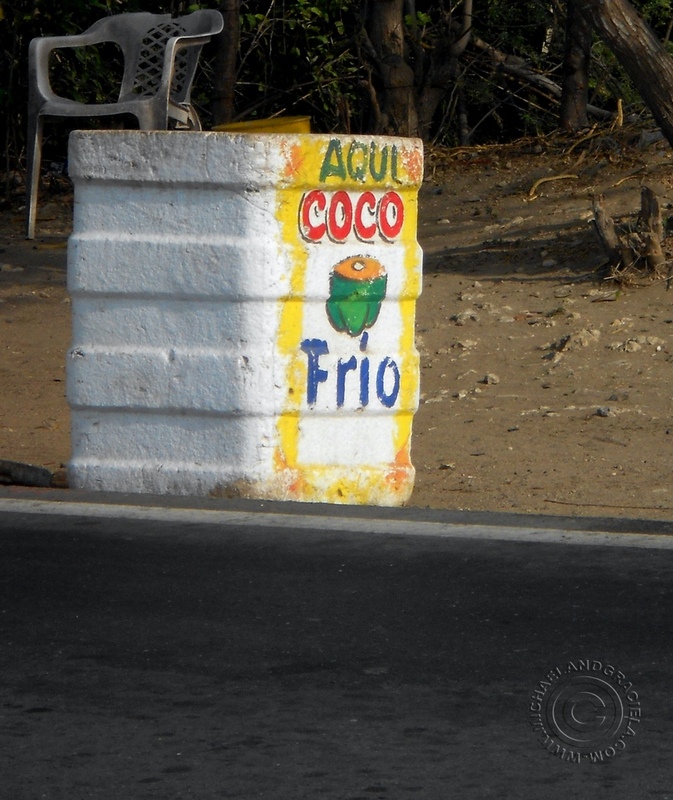 Graciela: Next day included a trip to the town of Puerto Colombia. My cousin and aunt lived in the town for many years. They and a friend, Jose, took us there. Compared to Bogotá the day was very warm. Along the route Jose stopped at a roadside stand. Well, to call it a stand is debatable. There was a large Styrofoam container filled with ice and coconuts. The seller sat under a shade tree aways back. For each of us the guy reached into the cooler, grabbed a coconut, hacked off the top with a machete and stuck a straw in it. Instant cool drink on a hot day. Over in the distance I noticed they were advertising 180 square meter new homes with an ocean view. No prices were listed. Soon from the main road we saw an impressive building with a large parking lot near. Exiting the car I noticed we were on a lee shore cliff high above the water. There were no signs about the impressive building with architecture I recognized as possible early to mid 19th century Spanish. Past the arch lined porch, doors opened to a lobby area with interesting decoration. Doors off this area opened to a restaurant and bar. Beyond that was a courtyard ringed on all sides by more arches. I slowly walked all three stories of the building trying to pay attention to every detail. If one looks very carefully much of the building’s history is revealed. Original construction was in 1848 by the Spanish on top of the old Fort San Antonio. 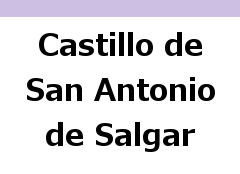 Consequently it’s full name is Castillo de San Antonio de Salgar. Most people just refer to it as Castillo de Salgar. The original use was for inspection and control of contraband. After Simon Bolivar won liberation from the Spanish it became a customs office. Over the years it has also been a center for defense, a jail, headquarters for a school, institute for the handicap, and a center for the arts. Today it serves as a restaurant, event center and tourist attraction. Many people have their wedding and/or wedding reception there. Here is a Youtube video showing the building from the air. The idea for our next stop was to show us where my wife’s cousin grew up. It was a house in Puerto Colombia. Despite the many years which have elapsed since she and her mother lived there people on the street recognized and greeted them. But it was what I saw in the distance that caught my attention and peaked my interest, a long, but broken up, pier jutting out into the Atlantic ocean. The construction and length fascinated me. I stood mesmerized for a long time trying to decipher why it was there. We did not have time to get closer and examine the decaying structure and locals could not tell me much of the history. But I knew there was a story there. It took some research. What I saw is one of the architectural marvels of Colombia. Cuban architect Francisco Javier Cisneros designed the 4,000 foot Muelle de Puerto Colombia. At the time of its construction in 1893, though other reports say the year was 1888, it was the longest pier in the world. Large ships docked along side the pier and unloaded their cargo. The pier operated until 1936 when the Bocas de Ceniza opened a path to the Magdalena River. This necessitated the move of port operations to Barranquilla. The magnificent structure and important part of Colombian history was allowed to slowly decay. In March of 2009 a cold front came through on the Atlantic. The strong winds caused large waves that crashed over the pier imparting massive forces to the weakened structure. On March 7 parts of the pier collapsed into the ocean. Graciela: On the third day we hired a taxi back to the airport. Since the drive took more than a half-hour we conversed with the driver and asked him what sights there are in Barranquilla to see. Instead of the answer given by previous people he rattled off, Museo del Caribe, the zoo, Plaza San Nicolas and Museo Romantico. The hotel provided everything we wanted and more. Catching up with relatives and learning more about my Father’s family as well as seeing old photos was emotional and enjoyable. But Michael taught me the American expression of “Fish and visitors smell after three days.” The time was a great beginning to learning about family and Barranquilla. I believe another trip in the future is necessary. Michael: Since our visit we have had the pleasure to host Graciela’s cousin in our home. I agree with my wife though that we need to return. Not only do I want to see the places we missed but to explore in detail and learn more about the pier and history of the area.